Traveling through the airport recently I was sent to a terminal that had an agricultural theme to it. There were all kinds of different sculptures based on vegetables lying around. 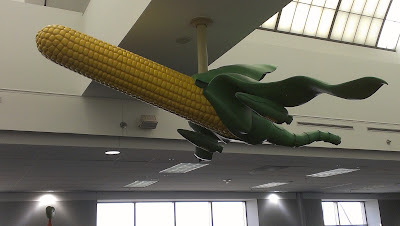 But since I live in the Cornhusker State (Nebraska for those of you not from here) I was drawn to a sculpture that probably would be right at home in the Omaha Epply Airport. As far as I am concerned, it's pretty corny.